This has been on my mind a lot lately. I believe that one of God’s greatest gifts is the gift of friendship. When I think back on my life, I always feel so much gratitude for the friendships that have helped me through every phase of my life. They have blessed me with their time, their encouragement, their love, their laughter, & their understanding. They haven’t judged me for my weaknesses but rather loved me for & in spite of them. A real friend leaves you feeling uplifted & inspired. You feel that life, with all it’s trials, is made more bearable because of the love & encouragement of true friends. It is important to know when you feel down that many others do also and that their circumstances are generally much worse than yours. And it’s important to know that when one of us is down it becomes the obligation of his friends to give him a lift. I hope that each of us will cultivate a sensitivity toward the feelings of others and, when encouragement is needed, make an effort to extend it. Be a friend and you will have a friend. God be thanked for wonderful friends. This is so true! When we reach out to others, we realize that they have their own personal struggles as well. Walls come down when we realize that those around us aren’t perfect. I can’t tell you how many times I’ve been surprised when I’ve really gotten to know someone because of how different they were from my first impressions. We can’t get to know others by observing them! We get to know others by spending one-on-one time with them. We often talk about the need to serve others & we get caught up in trying to think of “service projects”. But I think the greatest form of service is simply to be a good friend & to be available when someone needs to talk. In our fast paced world, this isn’t always easy to do. I know I don’t always feel like I have time for others. Most of the time I’m just trying to get through my day. This results in unintended isolation & that always takes a toll on my spirit. 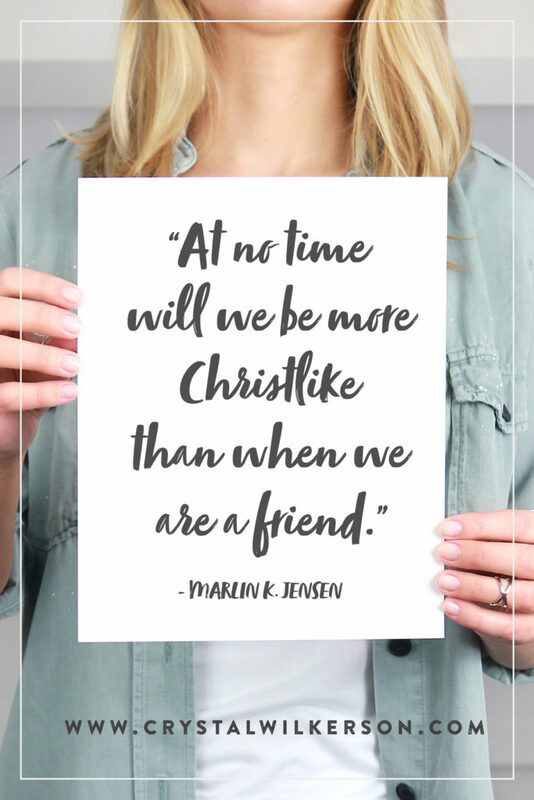 This is why we should pray for opportunities, as well as the desire, to connect with others. God knows who needs a friend & he will inspire us to be sensitive to the needs of others…but only if we ask him & if we listen to the promptings when they come. I notice a huge difference in my availability AND in my ability to connect with others when I am first taking time to connect with God. If someone’s name randomly pops into your head, make an effort to connect with them. It could be through a phone call, a letter, an email, or some other way. You never know if that is God’s way of telling you that someone needs your encouragement that day. He often uses us to answer someone else’s prayers. Every post of yours is worth reading. Your writing style was perfect. Keep writing.